Bathing in MMS water enables cleansing of pathogens that are on the skin surface or just under it. Cleansing at these outer levels seems to avoid overloading the internal elimination systems. Pathogens killed near the skin surface more-often move outward through the skin and float away. Wait until tablet dissolves completely. 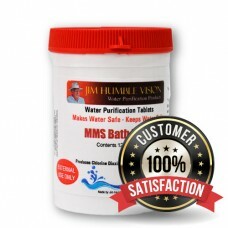 Diseases caused by bacteria or viruses will almost always be resolved through repeated exposure to MMS BATH TABLETS. NEVER LEAVE OPENED TABLETS TO LIE AROUND. MOISTURE IN THE AIR WILL ACTIVATE THE TABLETS. ALWAYS STORE TABLETS IN A COOL DRY PLACE.